Boing Boing is one of my favourite blogs and I usually check it’s RSS feeds on a regular basis. 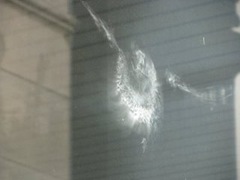 Recently, I’ve become aware of what I call “ghost pigeons, ” the imprint a pigeon makes on a glass window of a building when it unwittingly flies into it. They are spooky and depressing and kind of pretty all at the same time. Most people would have never noticed. This entry was posted on Saturday, December 6th, 2008 at 3:57 pm	and is filed under Funny, Odd & Bizarre. You can follow any responses to this entry through the RSS 2.0 feed. You can skip to the end and leave a response. Pinging is currently not allowed. My windows are covered in those, never thought of calling them ghost pigeons. Not desired; sometimes they really do hurt themselves. Birds – pay more attention to where you’re going. It’s all very well being the flighty representation of the souls reaction to movement and noises (in an archetypal sense), but if there’s never any stillness held here then everything’s going to just keep getting worse. On the other hand of course, not taking off suddenly at the hint of anything untoward, in this reality, will likely lead to your imminent death and / or damage also. One day I’m going to get out my soul tools and send the uncleanliness ringing out of you blue-pill humans.